When my tiny young daughter was a baby she would catch a simple virus and inevitably start to have difficulty breathing which would always progress to wheezing, retractions and ultimately required emergency intervention. One several occasions we almost lost our precious daughter and only through prompt medical care at the best children’s hospital did she recover. As a mother, I felt utterly and completely helpless to protect her particularly when she was later diagnosed with severe asthma and inflammation of her lungs. What did give me a sense of power was knowledge so I proceeded to stay up until all hours of the night as I devoured everything that I could find on asthma and related treatments. Unfortunately, many of the books that I found on asthma were outdated or did not pertain specifically to the special needs of children. I can’t explain how excited that I was to read Asthma Allergies Children: A Parent’s Guide by Dr. Paul Ehrlich, M.D., Larry Chiaramonte, M.D. with Henry Ehrlich. It is a wealth of current information pertaining specifically to asthma and allergies in the pediatric population. The physicians who co-authored this book are renowned, board certified pediatrician allergists who are obviously passionate about educating parents in a way that is simple and easy to understand i.e. no medical degree required to understand this book! Thankfully, Hannah has outgrown her documented allergy to eggs in the last year but a recent skin test and blood work has shown that her current allergic reactions were to grasses, pine and palm trees (did I mention we live in Florida?) The information provided about allergies in this book is phenomenal and I especially appreciated the “myths and realities of treatment” and how the environment can affect your child’s health. To truly make this book “real” the authors included numerous stories about actual experiences or real life situations involving asthmatic and allergic children. I can’t tell you how often I found myself talking out loud to no one in particular or nodding my head as I read these stories and related to it. Over the past two months, I have noticed that Hannah has started to have more trouble breathing at night and after exercising, dark circles under her eyes and difficulty speaking after exerting herself. The alarm bells rang because this was a symptom that is out of the norm for Hannah. Because of information that I had read in this book and of course mother’s intuition, I immediately made an appointment to revisit her pediatric pulmonologist for an evaluation. When I write a book review I am always hesitant to say the cliché, “This book is a must have” however Asthma Allergies Children: A Parent’s Guide is the exception. If you are a parent who is coping with a child who has asthma or allergies then please consider buying or at least reading this book. I do not think you will have any regrets and could perhaps learn something new like I did that could help your child, your family and your sanity. 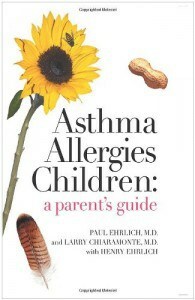 Asthma Allergies Children: A Parent’s Guide by Dr. Paul Ehrlich, M.D., Larry Chiaramonte, M.D. with Henry Ehrlich is available for purchase at Amazon for only $18.95. Special Update: Can a book save a life? In this case, I overwhelming feel that the information in this book possibly gave me the tools that I needed to save my daughter’s life after a terrifying asthma attack recently. Here is what happened as I shared behind the scenes with the authors and felt it important enough to share with you too. I am sending you and your co-authors my most sincere thank you for helping me save my daughter’s life. Hannah is 4 years old and has had respiratory problems since birth (she was born with pneumonia). Anytime she had a cold/virus she would have severe asthma symptoms and even though numerous tests showed that even when she “appeared” well she still had inflammation in her lungs we thought that we were experiencing the worst of it only when she was sick. Last week, we were taking a family bike ride to the park as we often do on a nice Florida day when Hannah began to cough and couldn’t stop. We asked her what was wrong and she was only talking in a whisper and continued to cough horribly. From information that I had read in your book, we knew something wasn’t right so we immediately went home to get her started on a nebulizer treatment….as we did the next coughing fit she turned blue around the lips and could no longer speak to us. We called 911 and emergency treatment was given as she was having a “severe asthma attack.” To be honest, I am not sure that I would have realized what was happening and acted so quickly if I had not read your book. I never dreamed that asthma could “change” so suddenly and happen when she was not sick with a virus. In fact, during her other severe asthma attacks……. coughing was never even a symptom….just wheezing and retracting with difficult breathing. I hope that you don’t mind my sharing this with you but it seemed appropriate that you should know how grateful my family is for this book.